Posted on January 31, 2018 by Matthew Leib. This entry was posted in Being Active and tagged Being Active, dare to do, Hiking, walking, Washington. Bookmark the permalink. From the court-clattering excitement of our co-ed basketball league to our daily Being Active squat challenge (it wraps today), January has been a month of movement at The Whole U. But looking back on your month—your progress—how much of that movement occurred inside? Now that days are getting noticeably longer, consider getting outside more when taking exercise. Celebrate your fitness progress with an invigorating trail run or gather friends, family, or colleagues for a quick day hike to reflect and prepare for the month ahead. 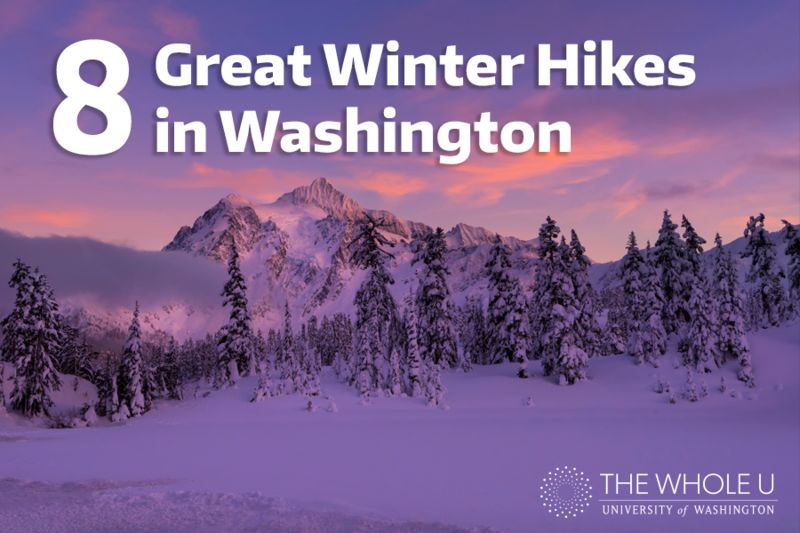 For a few ideas, we’ve put together a list of some of Washington’s most enjoyable winter outings so you can choose from sun-tipped seashores and snow-clad summits when taking the less-traveled path to moving more this winter. Why Go: UW Botanic Garden’s Witt Winter Garden is at its best during February and, beginning Sunday, February 4 through February 25, you can take Free Weekend Walks from 1-2:30 pm through an array of plant life—including many specimens found nowhere else in the Northwest. With a central lawn encircled by tall cedars and firs and unique small trees, shrubs and perennials at what seems like every turn, this is your best bet for “getting away” without the getting away. Why Go: Find a moment of solitude and serenity at the end of sea, city, and sky on Golden Garden’s pebbly beach. Soak in super views of Puget Sound and the Olympic Mountains on a clear day from the shore or explore the park’s two wetland areas, a short loop trail, and secluded northern beach. The park is also a great place to bring a pet with an off-leash area for dogs to the north of the park (Note: Dogs are not allowed on beaches, or children’s play areas in Seattle parks, per the Seattle Municipal Code). Why Go: For family fun, head to Heybrook Ridge. This hike starts at a low enough elevation so as not to be heaped in snow, but don’t be surprised if you reach the mountain views at the top to find them blanketed in the white stuff (look out and see Mt. Index, Bridal Veil Falls, and the surrounding Skykomish valley). Even the most reluctant hikers will find their reticence melting away somewhere between the first stream crossing and the surrounding stands of Alder trees on this eminently-doable 3.3-mile roundtrip. Why Go: Not a fan of snow? Hit the beach at Fort Flagler State Park. Once part of five military installations established throughout the Puget Sound, Fort Flagler became a state park in the 1950s and today boasts miles of prime, natural coastline. Start walking a 5-mile loop hike on the stony beach at the north of the park with views to Port Townsend and Whidbey Island off to either side. Grab a warm fleece or outer shell as the wind can change suddenly, but don’t let a few gusts stop you—it doesn’t phase the bald eagles often spotted soaring overhead. Why Go: Create your own adventure on a day trip to Fort Ebey State Park—a great reward after a winter of working out indoors. A popular spot for paragliders, look for them in the distance as views of the Olympics rise as dark and distant sentinels across the gunboat gray waters of the Strait of Juan de Fuca. Why Go: Take a “nature bath” in the forest and stand in awe of giant rocks towering overhead on this less-traversed loop that leads to the Old Mt. Si trailhead. Press on when you reach it for a winter twist on one of the region’s most well-loved hikes. Why Go: Steep, short, and satisfying, this is a prime winter day trek if you find yourself in Eastern Washington. Be sure to bring your snowshoes for a satisfying finish to this winter-only route to the mountain’s summit. The nearby ski area operates a winter-only weekend concession shop inside the 1934-built Vista House, so snag a cup of hot cocoa and toast your toes relaxing by the fireplace before heading back down or exploring this state park’s many other trails. Why Go: Grab a headlamp and start before dawn for stunning 360-degree views at sunrise. Ascend nearly 4,000 feet on your way to the top and views of Glacier and Snow peaks in the distance. Check the pass’ snow conditions first, however, to see if the trailhead is accessible. Share your favorite winter outing in the comments! Never tried the “Sunrise Hike to Mt. Dickerman”, next time I’ll check it out.